SCIENCE FICTION AUCTION: Featuring memorabilia of Dr. 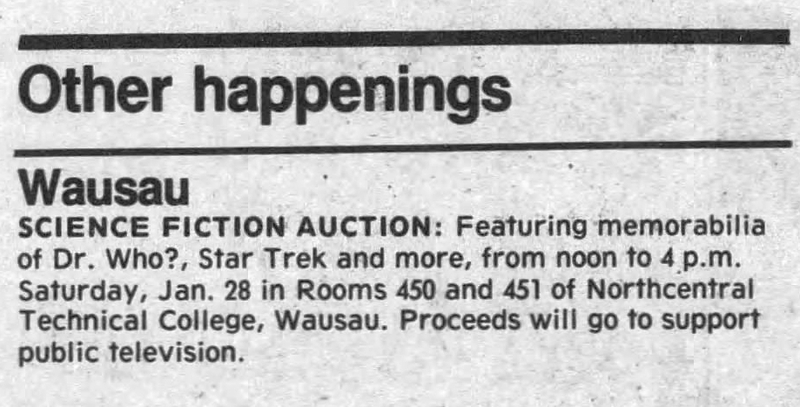 Who?, Star Trek and more, from noon to 4 p.m. Saturday, Jan. 28 in Rooms 450 and 451 of Northcentral Technical College, Wausau. Proceeds will go to support public television. APA 6th ed. : (1989-01-12). Science Fiction Auction. Wausau Daily Herald p. Focus, p. 2. MLA 7th ed. : "Science Fiction Auction." Wausau Daily Herald [add city] 1989-01-12, Focus, p. 2. Print. Turabian: "Science Fiction Auction." Wausau Daily Herald, 1989-01-12, section, Focus, p. 2 edition. This page was last modified on 13 April 2019, at 19:35.